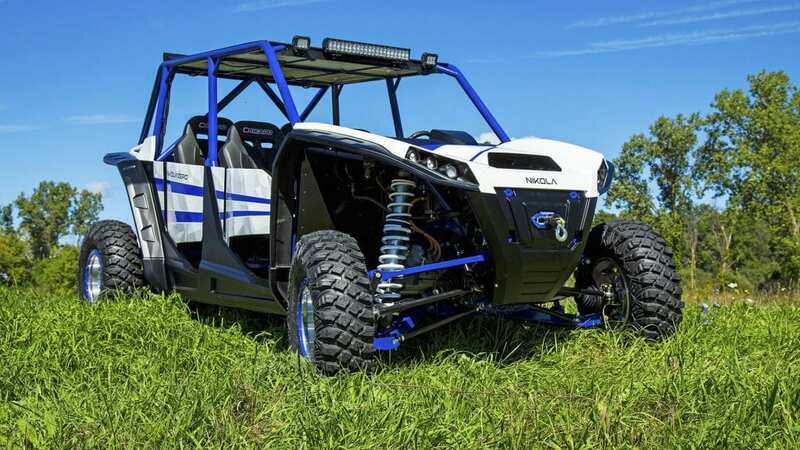 Nikola Powersports has finalized the specifications and design for an all electric four-seater UTV dubbed the Nikola Zero. The Nikola Zero UTV is an all-electric, 400-volt plug-in, off-road and potentially street-ready vehicle. Dealerships can begin reserving production units starting in January. Starting at $35,000, the UTV will come with two performance options: 415 hp and 3,675 ft. lbs. of torque and 555 hp and 4,900 ft. lbs. of torque. The UTV will also have three battery options: 75kWh, 100kWh and 125kWh, with the largest battery option giving the Nikola Zero more battery storage than a Tesla P100D. The 125kWh battery package can deliver 200 miles of range in 4×4 off-road mode. “The Nikola Zero will be the first UTV to come with optional Anti-Lock Braking Systems (ABS), stability control, anti-roll-over, traction control and torque vectoring. Normally these options are reserved for high-end sports cars and not normally found in UTVs. We have worked hard to make these UTVs street legal, and in many states, you may be able to drive the Nikola Zero UTV to work,” said Trevor Milton, Nikola’s CEO. “Once you test drive the Nikola Zero, you will want to trade in your current UTV. No other competitor UTV can match the Nikola Zero’s performance. We are not talking about a few seconds faster than the competition, we are talking about laps faster, with speeds up to 0-60 in 3.9 seconds with four passengers inside,” added Milton. Standard features include: 100-percent electric power steering, 20-inch front and rear suspension travel, 14-inch ground clearance, 62-inch wide frame, four independent electric motors, 32-inch tires, bead lock wheels, tow hitch, over the air software updating, 10-inch infotainment center display, 7-inch instrument cluster, multiple color options, IP 67 waterproofing, LED headlights, taillights and custom seats, all with a two-year warranty. Optional features include: 555 HP upgrade, street legal package (some states), 4×4 torque vectoring system, ABS, anti-roll protection, traction control, front and rear 4500 lb. winches, factory audio system, 15 kW power export at 110/220V, 4kW Solar 400-volt DC Charger, LED interior lighting, rider profiles, front windshield, mirrors, cameras and a four-year extended warranty package. A dealer ride and drive event is being planned in December in St. George, Utah. Dealers can contact sales@nikolapowersports.com for applications and to attend the ride and drive event. RSVPS are required.